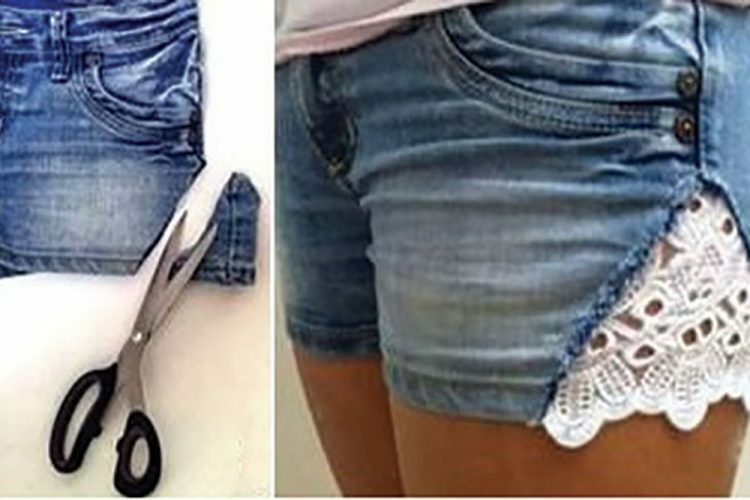 There are so many cool tricks that you can use to spruce up some of your regular clothes, or make them a bit less stressful to wear. This week Iâm going to show you how you can use three little tricks to really heel you out in the fashion department. Give your shorts some flair, or even some more room, by cutting a triangle at the out seam of the pants. Get some lace, or an appliquÃ© pattern and place it under or over the jeans. You can do it either by hand or on a machine; either way it looks so cute. If you donât want to cut the sides, you can cut the bottom and attach some lace as well. Want to wear that backless top, but donât want to go without a bra? Well, all you need to do is get a strapless bra or a regular bra and cut off the straps about 3â from the bone and simply attach three pieces of elastic and voilÃ , a great pattern with all the support in the world. If you want, you can attach clips at the end for easy detachment. If you have a backless dress and again donât want to go braless. Cut off the straps and back of a bra and sew it along the front of your dress. This will give you the protection of a bra, but without the hideous straps in the back. Donât forget to send your questions or comments to onfleekthisweek@gmail.com so that we can better help you. Until next week ladies, ta ta for now.